The tiny island of Bryher, Isles of Scilly, has two distinct faces. To the south and east, calm blue waters fill the narrow, sheltered channel between the island and its larger cousin, Tresco. Boats come and go whilst sunbathers enjoy the sandy beaches at Green Bay and the secluded cove of Rushy Bay. The northwestern shores, however, are a jagged jumble of weather-torn rocks, beaten and broken by the relentless Atlantic waves. Gales sometimes lash this coast with thousand-ton breakers, and places like Badplace Hill and Hell Bay have earned their names through reputation. Such schizophrenic characteristics make this island special. The sandy-beach bays to the island’s south are backed by dunes and provide ample opportunity for sunbathing, swimming and snorkelling, although the water can be a little nippy. Just beyond sits Samson Hill, the southernmost point of the island, with far-reaching views across the Scillies. The exposed, heather-covered plateau at the northern end of the island is dotted with prehistoric burial cairns. 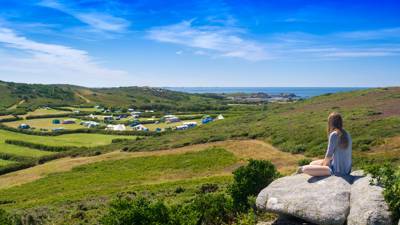 Situated a short climb uphill from the boat jetty, where a tractor collects your bags, is Bryher campsite. Despite boasting views of the harbour, Tresco Channel and Cromwell’s Castle to the east and the open Atlantic to the west, it still occupies a wonderfully sheltered spot between two higher hills. It’s tents only at this discreet site that blends effortlessly into the landscape of the island, though the recent addition of luxury bell tents means you can turn up with little more than a toothbrush and a sleeping bag and you'll get by. It’s undoubtedly a beautiful spot. But to really see the best side of this isle of contrasts, visit in the spring or summer when warm, sunny days turn the whole of Bryher into an idyllic island paradise. 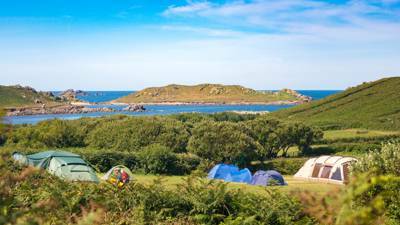 Nestled between two hills on the rugged island of Bryher, moments from a white sand beach and enjoying stunning panoramic sea views, Bryher Campsite is the perfect base for exploring the beautiful Isles of Scilly. With five camping fields, even in the height of summer there remains a wonderful sense of space. 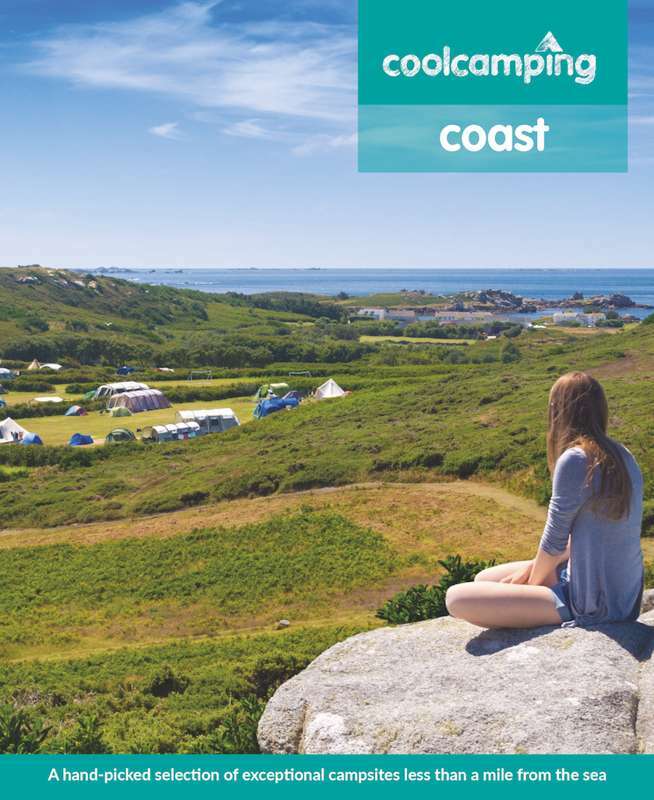 With traditional camping, you’re free to pick your own spot, whether you want to overlook Tresco Channel or the Atlantic, pitch next to your friends, or find a little corner all to yourself. We also offer fully-equipped Bell Tent rentals so you can just turn up, chill out and enjoy your holiday. Our Bell Tents are spacious, five metre tents with plenty of living and sleeping space for up to five people. They're fully kitted out so all you need to bring is bedding and towels. The campsite games field, with football goals and a Volleyball net, provides somewhere for the young (and young at heart!) to let off steam and meet new people. Bryher is an island of contrasts, with beautiful, safe sandy beaches on one side and dramatic cliffs on the other. The smallest of the inhabited islands, Bryher is packed with things to do and places to eat for a relaxing but fun island escape. There's also a brilliant local boat service, helping you get around and explore the other islands - or you could rent a kayak or small boat and go under your own steam! Getting here is as easy as hopping on the ferry or small plane from the mainland. Most importantly, once you've checked in your luggage you won't need to worry about it again until you reach the campsite, so getting your camping gear here couldn't be easier. The Best Campsite - par none! Steve and I have camped here 2 years running and will be going back next year too. And despite only being home for a week, I can't wait! The only sounds you will hear are the twittering of the sparrows and the murmur (sometimes soft, sometimes much louder) from Hells Bay at the back of the campsite where the Atlantic hurls itself onto the rocks. The campsite is now run by Jo and Tom, ably assisted by Pat, David and Adrian, all with a cheerful demeanour and friendly smiles. Firethorn brings you to Bryher from St Mary's and the Scillonian, where you are met by a big tractor and your bags whisked off to the campsite which is situated just up from Fraggle Rock - a very cool bar/restaurant. Choosing your pitch is tough as all of the fields have amazing views. Once settled, you'll find that the shower block and washing up area are very clean, recycling is just around the corner and there is a freezer, re-charging point, washer and dryer all in the same building. Everything is relaxed. Buy your groceries and treats locally at Bryher shop which has excellent quality bacon, chicken and steak, lusciously large vine tomatoes and a very good range of wine. Don't forget to try their Scillonian Tattie cake - absolutely scrumptious. Also go for the takeaway Paella on a Wednesday night from Island Fish (booking essential), find a bench with a view (not difficult) and enjoy meaty chunks of lobster and crab mixed in with fresh mussels, fish and tasty risotto. Enjoy all Bryher has to offer - you won't be disappointed. Bryher campsite has got to be one of the UK's best, given its fabulous location and even at the peak times (we just had a week there), it was still not too crowded. The shower block is small, but queues never last long. It's a trek to get to Bryher, but worth the effort! Whether you are sailing or flying, once you've got your camping kit on its way on the Scillionian, you don't really need to worry about it until you get to the site - it's transferred to the tripper boats and then met at the quay by the campsite tractor..... What a treat! A few things seem to have changed on Bryher in the last few years - the Bryher Boat Services are now run by Tresco Boat Services which caused us some confusion and inconvenience when we jumped on board to go to Bryher, only to be told it was only going to Tresco - so had to spend an afternoon in the pub on Tresco (there are worst ways to spend an afternoon!) but it did mean we couldn't get to the campsite until much later in the day...... Ah well! And a number of the options for food are taking bookings well in advance so if you were going for the first time and didn't know, it is impossible to get a booking anywhere on the island...... Luckily the shop is really well stocked so you can always self cater, but if you were unaware and went looking after the shop shuts......well, you can imagine. All that said, Bryher is still one of our favourite sites and the island itself is our fav of all the off Islands........so much to do and see - a wonderfully chilled holiday on white sandy beaches......we'll be there again in 2015! Bryher is simply my favourite campsite. If you want to get away from it all, there is no better place. You are met by tractor from the boat which takes your gear to the campsite. The island has beautiful sheltered beaches with whites sand and turquoise water on one side and dramatic cliffs on the other. The campsite can be a little windy but there are plenty of more sheltered spots to choose from. The shower and toilet blocks are always spotless and I've never been without hot water. There is a brilliant shop on the island with freshly baked bread and cakes. It's very well stocked if you want to cook your own meals. There is a pub, hotel and cafe on the island to eat at but these do get booked up so it pays to be organised. The campsite staff are very friendly and helpful. If you love walking, sailing, kayaking, beachcombing, wildlife and stunning views I cannot recommend Bryher enough. 5 camping fields with 78 pitches and 2 pre-pitched bell tents. Pitches aren't allocated; you are free to choose whether you want to overlook Tresco Channel or the Atlantic, pitch next to your friends or find a little corner all to yourself. Tents, glampers and well-behaved groups – yes. Dogs, motorhomes and caravans – no. 5 camping fields with 78 pitches and 2 pre-pitched bell tents, plus a separate games field football goals and a volleyball net. Toilets, basins and token-operated showers; coin-operated hairdryers and a shaver point. Washing machine, tumble dryer and a freezer for ice packs. Bell tents are fully equipped (including dining and cooking gear), just bring towels and bedding. Mobile phone-charging available. Tractor service for luggage from the quay (bookable in advance). The site stocks camping gas and other fuel, though for larger, non-disposable gas you must provide your own container. Bennett Boatyard (07979 393206) offers small motor boats, sailing dinghies, kayaks and stand-up paddle boards. Or jump on one of the regular the inter-Island ferry connections to the other islands (including larger St Mary’s and Tresco). If it rains, check out local artworks at the Golden Eagle Studio (01720 422671), near to the Hell Bay Hotel where, incidentally, spa treatments are another rainy day option. The island also has a fantastic Community Centre, with table tennis, games, puzzles, books, and pool, which can be used by visitors at any time for a small donation. There is also a small play park in the garden. The cosy Fraggle Rock (01720 422222), Scilly’s smallest pub, is just a few minutes’ walk down the hill towards the quay. The contemporary Hell Bay Hotel (01720 422947) has an outside bar deck overlooking the sea and outstanding local seafood in the restaurant and Crab Shack. Bar snacks are available at lunchtime and in the evening (reservations essential). Bryher Shop offers an excellent selection of food and drink, as well as freshly baked bread and pastries. You can also pre-order shopping to be delivered to the campsite on your arrival. Camping: £10.75 per person per night; children under 4 camp free. Bell tents from £51 per night (weekly bookings from £340 per tent per week). Sitting 28 miles off Land's End, Scilly may feel a world apart, but getting to Bryher couldn’t be easier. Take the Scillonian ferry from Penzance or fly with Skybus from Land's End, Newquay or Exeter. You'll then hop on a smaller inter-island ferry to reach Bryher. 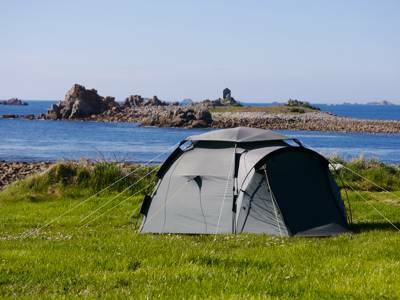 Bringing your camping gear is easy; once you've checked in your luggage at Penzance Quay or at the airport, you don't need to think about it again until you get to the campsite. Campsite staff will meet you on the quay on Bryher and transfer your luggage to the campsite for you. The site is just a 5–10 minute walk from the quay. Take a look at the information available from Isles of Scilly Travel. Extreme Atlantic isolation, one of England’s most naturally beautiful campsites.